On Sept. 2, 1859, an incredible storm of charged particles sent by the sun slammed into Earth's atmosphere, overpowered it, and caused havoc on the ground. Telegraph wires, the high-tech stuff of the time, suddenly shorted out in the United States and Europe, igniting widespread fires. Colorful aurora, normally visible only in polar regions, were seen as far south as Cuba and Hawaii. Earth's magnetic field normally protects the surface of the planet from some storms. In 1859, the planet's defenses were totally overwhelmed. Over the past decade, similar but less powerful storms have likewise busted through, giving scientists insight into what will eventually happen again. The outlook is not rosy. The solar storm of 1859 was three times more powerful than one that cut power to an entire Canadian province in 1989. Experts say if it happened today – and it could – the result might be unthinkable. The good news is that astronomers know what they're dealing with a little more nowadays and have the ability to forecast solar storms, with the help of sun-watching spacecraft. The storms originate – still largely unpredictably – from dark sunspots. Once the spots erupt, an initial wave of radiation strikes Earth in just minutes. The worst eruptions unleash another cloud of charged particles that billow outward and take anywhere from 18 to 36 hours to reach us; those can be spotted and evaluated on the way, allowing for relatively accurate predictions of arrival time and potency. We have the 1859 tempest to thank for ushering in the era of solar storm forecasting. 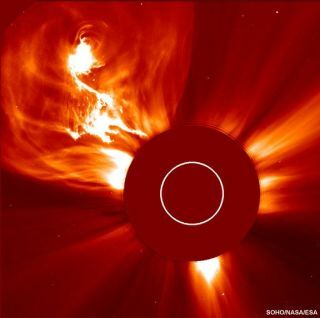 "The cause of all this [in 1859] was an extraordinary solar flare witnessed the day before by British astronomer Richard Carrington," according to Spaceweather.com. "His sighting marked the discovery of solar flares and foreshadowed a new field of study: space weather."